The Ruhr/Lower Rhine conurbation, or Ruhrgebiet/Niederrhein, is one of the most densely populated areas of western Europe and as a result boasts as many as nine more-or-less fulltime opera companies. This guide, a conflation of the Southern Ruhr and Northern Ruhr pages listed at the top of this blog, provides a personal introduction to each of them, listed in alphabetic order. Best known for beer and football, unprepossessing Dortmund can hold its own in the operatic field, too. 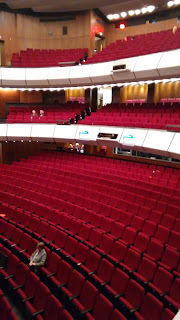 Theater Dortmund is the kind of place where a Strauss opera, Viennese operetta and West End musical can be in repertoire over the same weekend, yet it also recently mounted the German premiere of Mark-Anthony Turnage’s Anna Nicole, and has had a strong line in Mozart stagings in the last few seasons. As the Intendant’s motto puts on the company’s website, ‘We make the popular challenging and the challenging popular.’ (Its parallel activities in dance, plays and youth theatre combine to make it one of Germany’s busiest theatre operations.) The company operates a semi-stagione system, with productions in rep over several months. Theatre: the curved roof of this 1960s building, built on the site of the city’s bombed pre-war opera house, is a striking sight, and makes for a light, airy foyer (the ‘working’ part of the theatre is built into the neighbouring office block that comprises the company’s offices and workshops, and is separate from the Schauspielhaus for spoken theatre next door). The box office is just inside the main entrance, between the two entrance doors, and the foyer includes free, full-height lockers in lieu of cloakrooms. The auditorium is partly shaped by the curvature of the roof and seats 1,170 between Parkett and two Logenrängen (‘vineyard-style’ boxed tiers). Theater Dortmund is a 15-minute walk from the Hauptbahnhof – take the subway under the major ring road to the pedestrian zone and follow the red tourist signs via Hansaplatz. Tickets: €10–49, bookable online, printable or for collection. Practicalities: Dortmund is a major fulcrum on the Intercity and ICE networks, as well as a major focus of the local train service, so is a useful base. It also has an international airport (served by EasyJet, among others). As such, hotels are plentiful, though they can fill up when Borussia Dortmund is playing at home. Daytime: despite being flattened in the war, the city has plenty of history, though its cultural interest today lies more in the 20th-21st-century sphere: a leading contemporary art collection in the ‘U’ complex (the city’s former main brewery) and a sobering but fascinating museum covering the city’s history from 1933 to 1945 in the former Gestapo prison just north of the Hauptbahnhof (free admission). On a lighter note, the city is famous for hosting one of the country’s biggest Christmas markets, based around the world’s largest Christmas tree on Hansaplatz. Dortmund’s train connections make much of the rest of the area accessible for trips out. Nearby (average journey times by train / per-hour frequency pre-performance / per-hour frequency post-performance): Essen (23/3/3), Hagen (30/5/2). 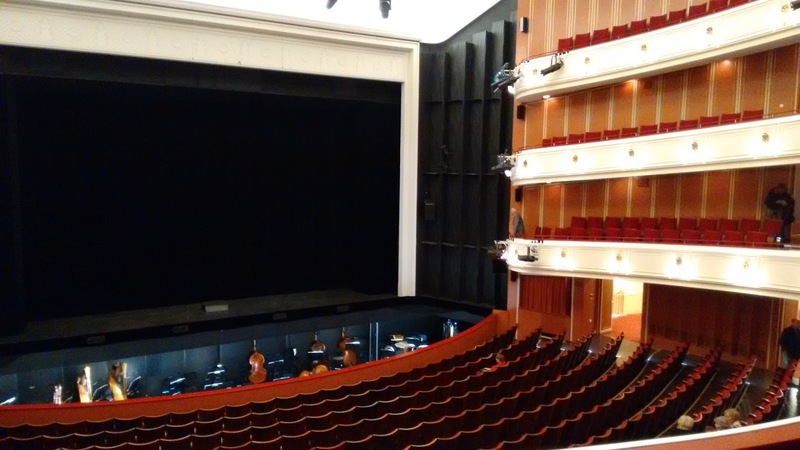 Theater Duisburg is the junior partner in the dual-theatre operation of the Deutsche Oper am Rhein based in Düsseldorf. Indeed, it is junior to the extent that it is in severe danger of being cut back to minimal operatic activities. But for the moment at least it shares productions and staff with the main house in Düsseldorf, though it has its own orchestra, which means performances run in both theatres concurrently, if somewhat more sparingly in Duisburg. It currently puts on about 100 opera and ballet performances a season, running in semi-stagione pattern. Theatre: a building from 1912, rebuilt in 1950 after bombing, and seating 1,218 in Parkett and two Ränge (see right). The Abendkasse is easily found just inside the entrance. The theatre is under a ten-minute walk from Duisburg Hbf. Tickets: €15–70, bookable online and printable. Practicalities: Duisburg is well-connected, being halfway between Düsseldorf and Essen on the intercity network and with plenty of local services well into the evening. As such, it would make a good base, if a rather uninspiring one. Daytime: Duisburg’s claim to fame is in being Germany’s largest inland port, at the point where the Ruhr runs into the Rhine. There’s a small area of surviving/rebuilt Altstadt near the rivers and revitalised dockland areas for eating/entertainment. Nearby (average journey times by train / per-hour frequency pre-performance / per-hour frequency post-performance): Düsseldorf (20/7/4), Essen (15/7/5), Krefeld (20/3/2). As the capital of North-Rhein-Westphalia and with the seventh largest population among German cities, Düsseldorf is the main cultural hub for the whole Rhein-Ruhr region. The city is well enough known and written about not to need further introduction, though other musical draws include its Tonhalle concert hall by the Rhein and a history that included Robert Schumann as its ill-fated director of music in the 1850s. Its opera company, the Deutsche Oper am Rhein, by its very name claiming national status, spills beyond the city to encompass a second base in neighbouring Duisburg (see above). Düsseldorf, though, offers the fuller programme, making it, with the addition of ballet, as busy as the opera companies in Cologne and Essen. It is reasonably well regarded for the scope of its repertoire, and a new Ring cycle has been announced for the 2016–17 season. Theatre: Düsseldorf Opernhaus is situated on the edge of the Altstadt, the city’s nightlife centre, conveniently next to the well-connected Heinrich-Heine-Allee U-Bahn (underground) station, which is a short three stops from the Hauptbahnhof (or about a half-hour walk). The building, on the site of the bombed-out 19th-century Stadttheater, is a functional and sleak 1950s construction, which can seat just short of 1,300 patrons in a large Parkett and three shallow tiers. Row 14 and back in the Parkett, plus the very sides, are in the overhang, and sides of the upper two tiers offer a somewhat restricted view of the stage. 2015/16 repertoire: Arabella, Die Zirkusprinzessin, Don Carlos, The Golden Cockerel, Die lustige Weiber von Windsor, plus revivals of Die Zauberflöte, Aida, The Fiery Angel, Die Entführung aus dem Serail, Le nozze di Figaro, Hänsel und Gretel, Les contes d’Hoffmann, Tosca, Lohengrin, Lucia di Lammermoor, Don Giovanni, Carmen, Rigoletto, Der Zwerg, Der Rosenkavalier. Tickets: €15–82, bookable online and printable. Practicalities: As Düsseldorf is a leading centre for shopping and commerce, there’s no shortage of hotel accommodation, though prices tend to be higher than the rest of the region, especially during trade fairs. There are plenty of options near the Hauptbahnhof, though the area to the south is somewhat insalubrious – the more upmarket places are in the Altstadt or near the Königsallee luxury shopping street. A handful of places include a free Ruhr-wide travelcard for the duration of your stay – always something worth looking out for (equivalent to c.€27 per day, including the full extent of the day you leave). Düsseldorf makes a convenient base for visiting all the other opera houses in the region – Duisburg and Krefeld are even linked by tram. The international airport is an easy ride away via S-Bahn. Nearby (average journey times by train / per-hour frequency pre-performance / per-hour frequency post-performance): Dortmund (60/3/3), Duisburg (16/7/4; plus tram/U-bahn), Essen (40/6/5), Gelsenkirchen (40/2/2), Hagen (45/2/1), Köln (33/4/2), Krefeld (30/3/2; plus tram/U-bahn), Mönchengladbach/Rheydt (33/2/1; plus further deps changing MG Hbf), Wuppertal (20/3/2 + Schwebebahn connection). Essen runs on a semi-stagione system, with long runs of new productions interspersed with short ones – maybe just three performances – of revivals. It’s often possible to catch two operas in a single visit. Theatre: Essen has what must be the only opera house since Dresden’s Semperoper to be named after its architect, but the city was so proud of the result that it named the building, completed in 1988, as the Aalto Theater, after its creator, the Finnish master Alvar Aalto, who had died during its long journey to fruition. It is indeed an iconic piece of modern architecture, admired as much for its sleek beauty as for its practicality – gleamingly white outside and in the foyers and refreshingly blue in the auditorium itself, which is highly unusual in being semi-circular but asymmetrical, as if an uneven bite has been taken out of a Greek theatre. It seats 1,125 in Parkett and two slender balconies, giving excellent sight-lines from all areas; the box office is in a little ‘pod’ within the outer foyer. The theatre is less than ten minutes’ walk due south of the Hauptbahnhof and even has its own eponymous tram stop outside. It’s also worth noting that the Essen Philharmonie concert hall – the main symphonic venue in this part of Germany – is virtually next door and hosts all the great visiting orchestras. Practicalities: Essen’s central location in the Ruhr (it is indeed regarded as its capital) makes it the ideal base – apart from Mönchengladbach, all the region’s venues can be reached comfortably from here. A couple of hotels (InterCity and City Hotel) offer Ruhr-wide public transport tickets in the room price, which is always good value, but there’s a reasonable spread of places to stay at all prices, many of them close to the station and thus the opera house. Note that, as with a number of cities in the region, room rates rise markedly when there’s a trade fair/Messe on. Restaurant choices are fairly limited, both near the opera house and in the central shopping area. Daytime: Essen markets itself as shopping capital of the Ruhr, but the city also offers some of the region’s cultural highlights. Principal among them must be the Folkswang art gallery, a short walk across the park from the Aalto Theater, and home to one of the best collections of 19th- to 21st-century art anywhere, with representative works from all the great artists from the German Romantics onwards. The other draw is the Zollverein Coking Plant in the city’s northern outskirts, a vast former industrial complex built between the wars in modernist Bauhaus style and now housing a fascinating museum on the Ruhr as a whole and on the mining history in particular. Essen city centre is a pleasant enough place for a wander, with several historic buildings surviving, including its Romanesque church. A highly recommended excursion is to the neighbouring town of Kettwig, a rare surviving example of a historic townscape in the region, full of old half-timbered buildings clad in the distinctive local green slate and with atmospheric lanes tumbling down to the River Ruhr – there’s also a pleasant riverside path. The S-Bahn line between Essen and Düsseldorf, along which Kettwig sits, is a surprisingly rural and scenic ride. The town centre is a 15-minute walk from either Kettwig or Kettwig-Stausee stations. Nearby (average journey times by train / per-hour frequency pre-performance / per-hour frequency post-performance): Dortmund (23/3/3), Duisburg (15/6/5), Düsseldorf (35/5/4), Gelsenkirchen (8/4/4), Hagen (37/2/1), Krefeld (40/2/2), Wuppertal (46/3/1). Nearby (average journey times by train / per-hour frequency pre-performance / per-hour frequency post-performance): Dortmund (40/4/4), Essen (8/4/4). On the face of it, Hagen is one of the more unprepossessing of the Ruhr’s towns: a bit down on its luck, saddled with municipal debt and with few cultural sites, though it is scenically situated among hills and adjacent to some of the River Ruhr’s leisure hotspots on its reservoirs. However, its theatre is one of the region’s more enterprising, tackling interesting repertoire (neglected American operas have been a recent theme) with energy and skill - but catch it soon, since recent budget cuts are currently threatening the company's very existence. Theatre: Theater Hagen is a Jugendstil building from 1911, reduced to a shell by American bombardment in 1945 and rebuilt four years later. 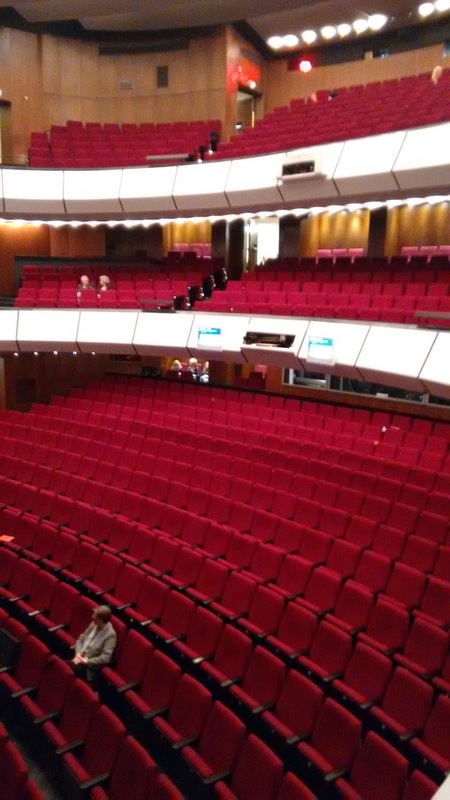 Unfortunately, the rather tired state of the seating suggests not much more has been done to the auditorium since, though it’s otherwise a comfortably intimate, rectangular space with 774 seats distributed between Parkett/Orchester and two upper tiers. A neat widget on the website shows what the view is like from different parts of the theatre. The venue is on one of the main shopping streets, approximately ten minutes’ walk from Hagen Hbf. Note that the box office (including Abendkasse) is in an annexe to the right-hand side of the main frontage and difficult to find from inside the foyer. Hagen uses the semi-stagione system with extended, overlapping runs that also feature musicals. Practicalities: It’s possible to stay in Hagen, but other than on a flying visit it may prove preferable to stay in neighbouring Dortmund, Essen or Wuppertal for their greater general cultural attractions and connectibility. Nearby (average journey times by train / per-hour frequency pre-performance / per-hour frequency post-performance): Wuppertal (25/3/1), Essen (39/2/1), Dortmund (30/1/2). Theater Krefeld is the northern arm of the two-city Theater Krefeld-Mönchengladbach operation (see below for Mönchengladbach) and uses the ‘semi-stagione’ scheduling system. 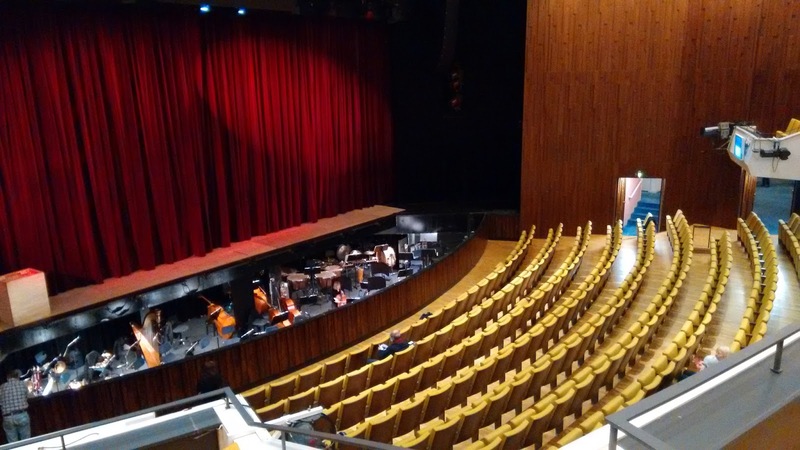 The two theatres share an orchestra, the Lower Rhine (Niederrhein) Symphony, meaning that although seasons run concurrently, individual performances broadly alternate in short batches between the two venues and it is possible to see a couple of different operas in the same theatre on consecutive nights. Although Mönchengladbach and Krefeld are only 25km or a 20-minute train journey apart, the theatres enjoy distinct audiences, as suggested by the fact that a new production given in one venue one season will usually be presented afresh in the other the following year. 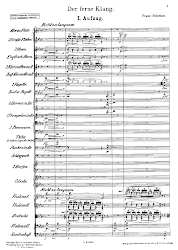 Repertoire is an eclectic mixture of popular classics with some rarer material – the company was the only one outside the Wagnerian heartland of Leipzig/Berlin to present Rienzi in the composer’s bicentenary year, for example. Theatre: a modern building situated to the north of the city centre and a good 20-minute walk from Krefeld Hbf, or a five-minute tram ride. Theater Krefeld (right) has an intimate auditorium seating 674 between Parkett and a single balcony. Tickets: €12-38, bookable online and printable. Practicalities: there’s a convenient Ibis Budget hotel near the station and places to eat in the shopping streets between the Hbf and the theatre, but it’s not the most inspiring place to base oneself for more than a single night. Daytime: there’s not much else to keep you in this city, but it provides convenient rail links to the historic towns of Kleve and Xanten to the northwest, as well as to Düsseldorf and Cologne. Nearby (average journey times by train / per-hour frequency pre-performance / per-hour frequency post-performance): Duisburg (20/3/2), Düsseldorf (35/5/3), Essen (40/2/2), Mönchengladbach/Rheydt (22/3/2). Theater Mönchengladbach is one half of the Theater Krefeld–Mönchengladbach operation (see above for Krefeld) and uses the ‘semi-stagione’ scheduling system. The two theatres share an orchestra, the Lower Rhine (Niederrhein) Symphony, meaning that although seasons run concurrently, individual performances broadly alternate in short batches between the two venues and it is possible to see a couple of different operas in the same theatre on consecutive nights. Although Mönchengladbach and Krefeld are only 25km or a 20-minute train journey apart, the theatres enjoy distinct audiences, as suggested by the fact that a new production given in one venue one season will usually be presented afresh in the other the following year. Repertoire, though limited in number of productions each season, is an eclectic mixture of popular classics with some rarer material – the company was the only one outside the Wagnerian heartland of Leipzig/Berlin to present Rienzi in the composer’s bicentenary year, for example. Theatre: just to confuse matters, Theater Mönchengladbach is not in Mönchengladbach itself, but in the neighbouring town/suburb of Rheydt, six minutes south by train – the generously lobbied postwar building (90% of Rheydt was bombed in the war) sits in a little park just a few minutes’ walk from Rheydt Hbf. Its plain, square auditorium seats c.778 divided between Parkett and Balkon. Practicalities: if not using the area as a base, there’s little reason not to stay in Rheydt itself: Parkhotel Hayma (www.parkhotel-rheydt.de/) is reasonably priced and just across the road from the park and theatre. Restaurants and shopping streets are within walking distance. With one of Germany’s major football teams in the vicinity, hotels can get heavily booked out on home match nights. Otherwise, central Mönchengladbach can be reached by twice-hourly trains and additional local buses after performances. Daytime: there’s little to see in Rheydt, so head to Mönchengladbach itself – this was only 60% destroyed by the RAF and a few older buildings survive, notably the Münster, or abbey church, on the top of the hill that forms the historic heart of the city (church closed Mondays) and a few fragments of the former city walls. There’s also one of the country’s leading contemporary art museums, the Abteiberg (www.museum-abteiberg.de/, also closed Mondays), all about 15 minutes’ walk uphill from Mönchengladbach Hbf. Aachen is an hour away and Düsseldorf 20 minutes. Nearby: Krefeld, Düsseldorf, Aachen, though late-evening train connections are thin on the ground. Wuppertaler Bühnen has unfortunately recently lost its whole operatic ensemble (and closed its separate Schauspielhaus) in a drastic cost-cutting exercise, and a reduced roster of operas - only half a dozen in 2015/16 compared with eight or more in previous seasons - will now be cast with guest singers. Yet artistically, the company has been on a roll and always seems to throw up something worth travelling for each season, culminating in a Parsifal of international stature in March 2015. Performances are given at the Opernhaus in the Barmen district of the city, also the home of the world-renowned Pina Bausch Tanztheater Wuppertal contemporary dance company. The company operates almost to a ‘stagione’ system, with often only a small overlap between productions and meaning it’s usually only possible to see a single work in one short visit. Theatre: an intimate, modern, semi-circular auditorium in a reconstructed Jugendstil shell from 1905, seating c.360 in the stalls, c.150 in the first tier and c.120 in the second tier. Good sight-lines from most seats, though rows 1-3 and 5 of the stalls are not raked. Tickets: €8-41, bookable online and printable. Practicalities: Wuppertal, the one-time textiles hub of Germany, is a ribbon city strung out for some 13km along the leafy valley of the Wupper river, and a conglomeration of formerly separate towns. The opera house is adjacent to Barmen DB station and close to Adler Brücke station on the Schwebebahn, the ‘swinging railway’ that is suspended over the river and is the city’s main transport link. Most of the hotels and other infrastructure, though, are in Elberfeld, close to Wuppertal Hauptbahnhof and some ten minutes to the west by Schwebebahn (an easy connection). There’s a vast redevelopment of the Hauptbahnhof frontage underway until 2017, which is making getting between station and town a bit of a hassle, but it’s still manageable. Wuppertal is second only to Essen in convenience as a base to stay while visiting different theatres in the region. Especially if you are using Wuppertal as a base, it’s worth considering staying in one of the handful of hotels that provides a ‘free’ (ie included) Ruhr-wide travel pass (worth €27 a day and valid on all non-Intercity transport, including the Schwebebahn) for the duration of your stay, including the InterCity and Central hotels. Apart from the theatre café there’s nowhere to eat immediately close to the Opera House, and in Elberfeld, the Luisenviertel offers more restaurants than the central shopping area. Daytime: Riding the Schwebebahn is an attraction in itself. Elberfeld is home to a leading art collection, the Von der Heydt Museum, and there are several concentrations of grand villas built by textile magnates in the late 19th century worth wandering past, particularly in the Briller and Zoo areas – pick up a walking guide from the Tourist Office at Schloßbeiche 40. Near the Opera House in Barmen is the birthplace of Friedrich Engels (now a museum) and behind it a further museum of early industry. For a more rural experience, take the S7 train to Solingen-Schaberg and explore the picturesque, wooded lower Wupper valley on foot, with a chance to marvel at the engineering wonder of the Müngsten Bridge, the highest steel railway bridge in Germany, and visit Schloß Burg, the one-time seat of the Dukes of Berg, now a regional museum covering the history of the Bergischer Land. Otherwise, Cologne is only 45 minutes away from Wuppertal by train and much of the rest of the region is equally accessible. Nearby (average journey times by train / per-hour frequency pre-performance / per-hour frequency post-performance): Düsseldorf (25/4/2), Hagen (25/3/1), Essen (46/3/1), Dortmund (49/1/1), Cologne (45/3/2). Disclaimer: this guide has been compiled in good faith using facts available at time of writing, but please double-check practical matters – repertoire, prices, train frequency etc – with the appropriate websites and organisations before making any travel or ticketing arrangements.